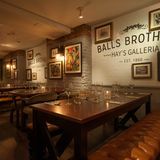 Balls Brothers at Hays Galleria serves British food in an atmospheric bar and restaurant, ideal for dinner or drinks parties. The Fish Restaurant at Balls Brothers Hay's Galleria excels at creating the finest fresh fish and seafood dishes, using produce delivered daily from trusted local suppliers. The menu offers everything from English rock oysters from Maldon and roast fillet of wild bass to lobster thermidor and local Billingsgate fish pie. What did you think of Balls Brothers at Hay's Galleria? A nice chain bar on Tooley Street, Balls Brothers is a good place to meet up before going on elsewhere. They've got a good wine list and the staff are always friendly. It may be a chain, but I like Balls Brothers a lot. During the week this is an ok place for an afterwork glass of wine. On a Saturday it's a disaster - waited 7 minutes before we could find a waiter; then after ordering food (just a simple plate of chips to go with our wine - nothing that could seriously task a kitchen - 25 minutes before we abandoned hope of it ever arriving, paid for the wine and left. Saturday staff appear unmotivated, unmanaged and uninterested. I visited this restaurant for lunch with a friend we was just in the area for the afternoon but ended up staying into the evening! I had the Steak on volcanic rock and it was mouthwatering. You cook if yourself so its exactly the way you like not to mention the added fun pretending to be on master-chef while it cooked on our table. The staff are helpful and if your a complete wine novice like me, you will be saved any embarrassment as after staring at the menu for 5minutes blankly the waitress came straight over and asked if they could suggest something. Two bottles of red later we decided to nibble on a seafood platter which was nothing short of amazing. I will definitely be returning soon! 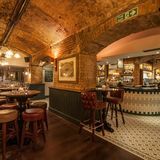 This subterranean bar and restaurant uses its Thames-front property wisely, serving up delicious local produce and a comprehensive wine list. 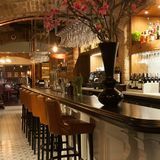 Although most of this expansive bar is located underground, you would be hard pressed to miss the ground-floor entrance, situated as it is next to the enormous ship-shaped fountain in the centre of Hay's Galleria, a grandiose covered courtyard just down the road from London Bridge station and leading on to the Thames walkway. The discreet front door is preceded in summer months by an outdoor drinks area, and even a nearby pétanque court, should the need suddenly arise. 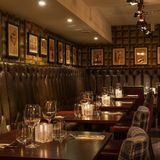 Down the stairs, the cellar-like space is distributed evenly between a casual drinks area, neatly segregated into intimate booths and cubbyholes by the coarse, exposed brick pillars propping everything up, and the more formal dining rooms at the back, which are made up of many tables and high-backed chairs capable of seating any number of groups and couples. The considerable wooden bar runs at an angle to take in both these areas, and is smartly embellished with flowers, wine racks and vintage knick-knacks befitting a top-notch winery. Lighting is subtle and dimmed throughout, and the flagstone flooring and oil paintings all contribute to lend a touch of class. As a credible alternative to City restaurant chains such as All Bar One and Corney & Barrow, Balls Brothers acquits itself superbly – the noise levels are bearable, the clientele is well-spoken and friendly, and the service is excellent. Of course, the venue is part of a chain itself, but credit is due to the management for trying to find their own voice with a personable atmosphere and singular events, including wine tasting and attractive packages for the Olympic Games and other sporting events. In such a highly-strung area as London Bridge, it is refreshing to find such a hospitable, laid-back spot in which to while away the post-work hours. Another ace up the venue’s sleeve is the excellent and relatively affordable menu at its disposal, with delicious mains including rose veal schnitzel and whole roasted poussin available for anywhere between £12-£19. Given the bar’s location, fish features prominently, and the skinned sea bass (£18) is particularly rewarding – extravagant seafood platters including oysters, lobster and shrimp are also recommended, especially for group bookings. Elsewhere, slightly less appealing starters and salads (£6.50–£10) are on hand for those not in it for the long haul, and a delectable array of desserts (£5.50) rounds out an impressive spread. As you might expect for a self-styled wine bar, the selection is both wide-ranging and eclectic, with reds, whites and rosés from around the world. The unremarkable house wines are a little pricey (£11.50), albeit often slashed to half-price during happy hour, but there is real strength in depth elsewhere, with some recent sauvignon blancs in particular complimenting the fish platters. Champagne and prosecco are also available at £6-£10 per glass, while the enticing cocktail menu (including a stunning grapefruit cosmo at £7.50) should satisfy any esoteric cravings. Then there’s the small matter of beer and cider, which is liberally dispensed at the bar at standard City prices (£3.40-£4.40). A cut above most City chain pubs, Balls Brothers makes an effort to stand out from its competitors with a great wine and food menu, and a conspicuously relaxed atmosphere.